Affiliate Links // Some items in this outfit were provided c/o the brand. All opinions are my own. When I saw overalls trending again last spring, I immediately was thrown back into my childhood. I remember multiple pairs of overalls over the years that I wore to death. Overalls are like jumpsuits, only better because they actually have a fairly quick and easy way to get out of them when nature calls. I’m sure if you’re an avid jumpsuit or romper wearer, you know exactly what I’m talking about. I hesitated on grabbing overalls. I assumed they wouldn’t be around for more than one season, and I wasn’t sure that I needed to have a pair of my own. But then, they’re still around. And I’ve honestly seen some pretty darn cute outfits featuring overalls so I decided I must indulge in this trend for myself. I picked up this white boyfriend style pair at Old Navy. When I’m adding a trendy piece like a pair of overalls to my wardrobe, and I’m not completely sure how much I’ll wear them, I almost always go for the least expensive option. If I find myself wearing a trendy piece a lot, I’ll often pick up a second piece of higher quality. To be fair to Old Navy. However, their denim is of good quality. I have had many pairs of jeans last me 5+ years with minimal fading and rarely a rip or tear. So really, even at $30, I can almost guarantee that these overalls will be around for a couple of years if I want them to be. So how the heck do you wear overalls and not look like a 5-year-old? I think wearing other wardrobe staples with overalls is one way. To me, wardrobe basics always look sharp and put together. Doing too much in a trendy outfit (e.g. mixing patterns, wearing too many other trends, etc.) can overwhelm the eye. 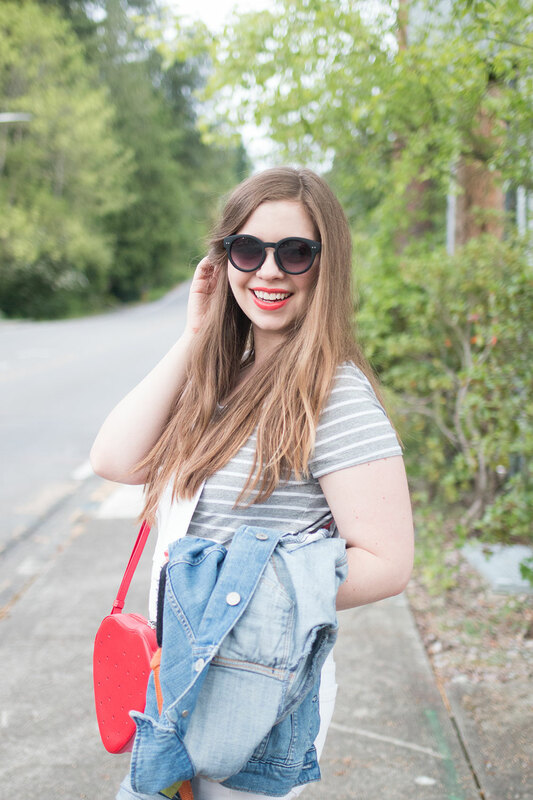 In this outfit, I opted to go for simple; a striped tee, denim jacket, and black sandals round out the outfit. For a pop of color and whimsy, I added the most adorable strawberry crossbody bag from Mywalit, a colorful leather goods maker from Italy. For the Seattle locals, you can find cute accessories from Mywalit’s collection at Pirkko, an adorable boutique focusing on European designs near Pike Place Market. The bag is made of high quality, soft as butter leather. 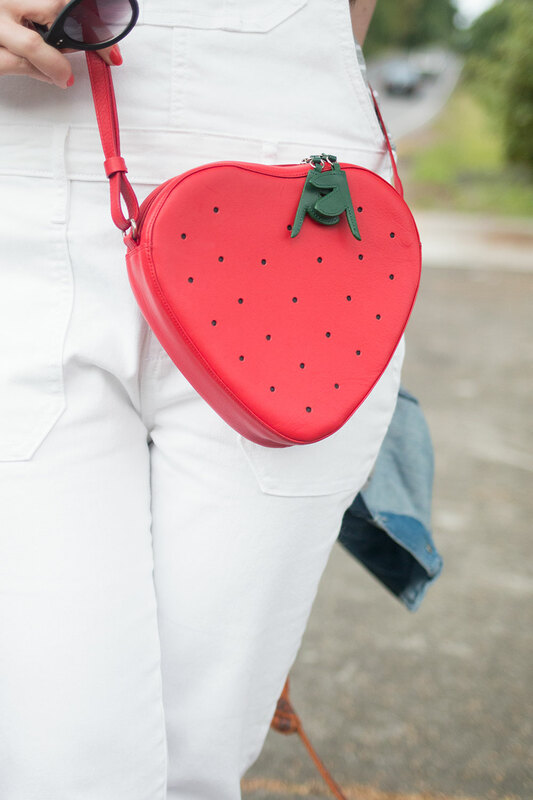 The adorable zipper pulls are the leaves of the strawberry, and inside there is plenty of space for all the essentials. It’s nearly impossible not to smile when you see the bag! If you’re a fan of color, definitely check out Mywalit for all of your pop of color accessories! They also have a fun Instagram treasure hunt happening now on their account. At the end of the hunt, you’ll unlock a special discount code to be used site wide! How do you like to wear new-to-you trends? Do you have any secrets for styling clothing pieces that remind you of your youth, like overalls do for me? I’d love to hear your styling secrets or thoughts about the outfit in the comments below! I remember wearing overalls at 9 years old and always associated them with kids. Imagine my surprise when I tried on a pair at Urban Outfitters last week and FELL IN LOVE! I think they’re a little youthful, yes, but in the most charming, playful sort of way. It looks like you’re ready to play some bocce ball in the park or stroll on the beach. Adorable! I have been on the hunt for a pair of overalls this season after seeing everyone posting updated, trendy outfit ideas! 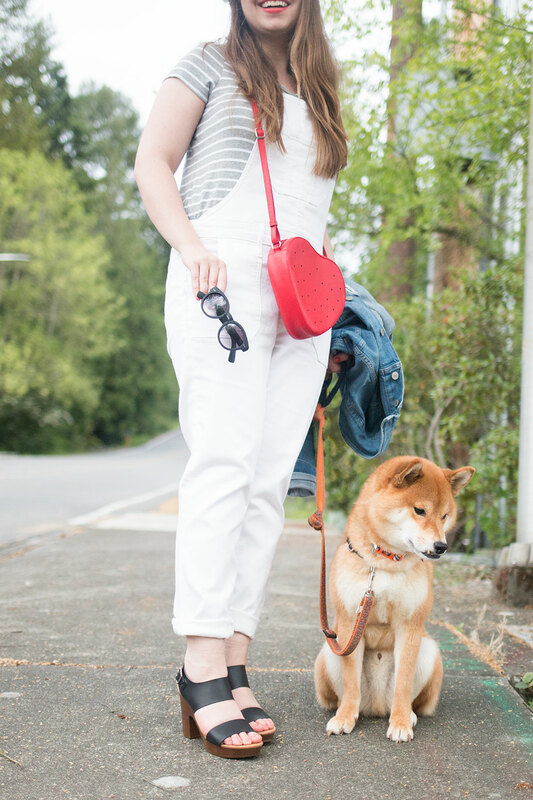 Love the idea of white overalls and how you styled this with the striped tee and cute strawberry purse. I will admit, I gave major side-eye to overalls coming back last year because they became so ‘uncool’ to me after wearing them as a kid, but something flipped in me this year and I totally want a pair now. Pairing them with a crop top is genius to me! Note to self: go get some overalls and a crop top to wear under them! I have been weary of the overall trend but you totally nailed it! Great inspo, Jenn! You are ROCKING those overalls!! I’ve been going back and forth on this one. I’d sworn I wouldn’t be bringing that trend back but then I find myself seeing it paired in cute ways. Now I’m like …”maybe?”. You look great in them and I like the crop top suggestion. That purse?! So cute!! Aw thanks Les! I definitely like the look of the white overalls, I think it makes them much more versatile! Adorable! 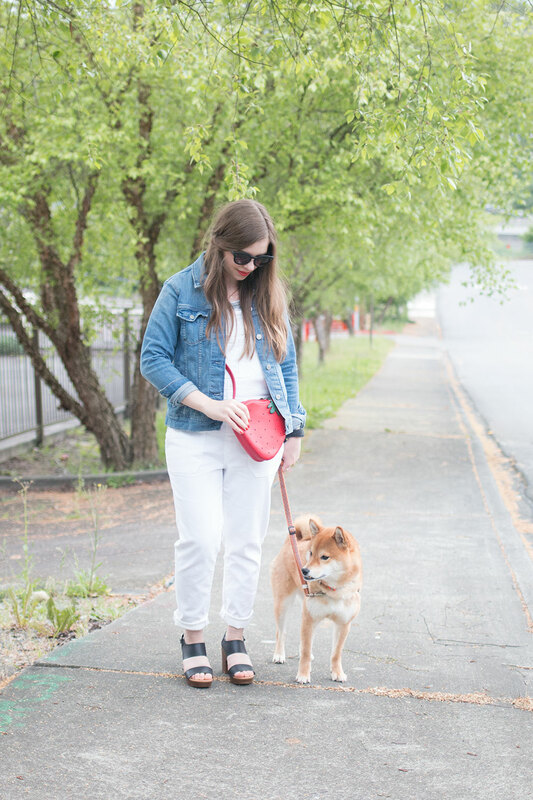 Overalls… bag… and puppy, absolutely adorable! How cute are you?! I have always wanted to get back into overalls, but I haven’t found any that fit my long legs right. The white ones are perfect on you! 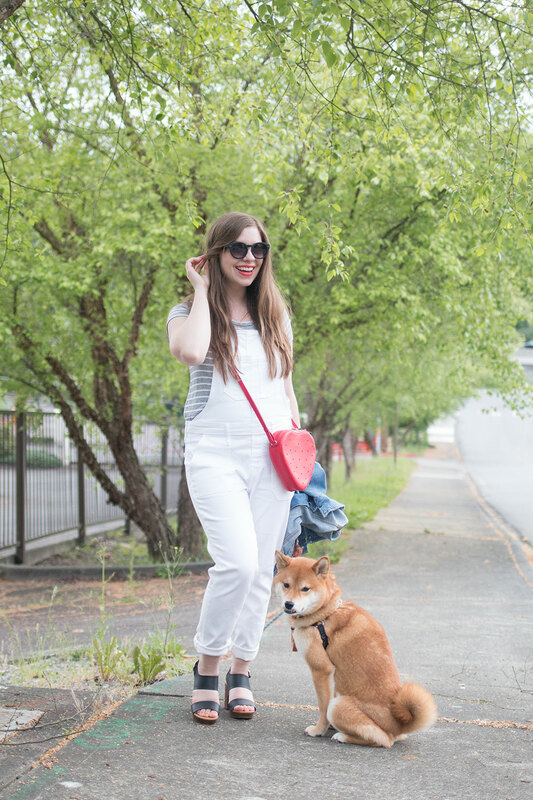 Love the white overalls…..so cute! I remember these were popular when I was growing up in the 70’s..I don’t remember wearing them much..I think I was in skirts most ot the time! Your dog is so adorable! Thanks so much Valerie! :) Overalls are fun to switch it up from all the dresses and skirts I normally wear in the summer!